I have something so cheerful for your Friday! 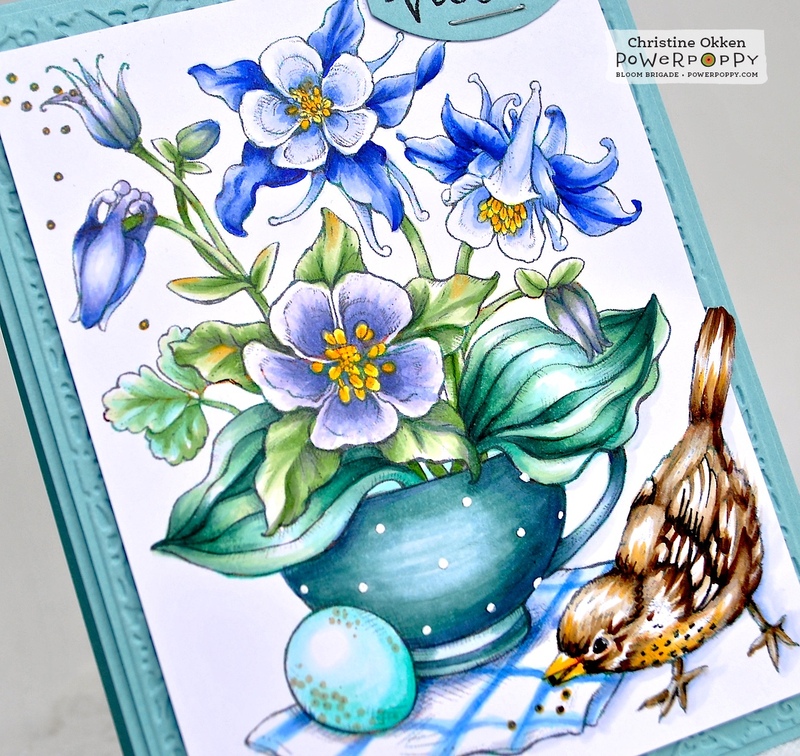 Marcy has illustrated a new Colour Story Illustration for the month and it’s a gem! It’s called Cup of Columbine. There are two versions of the image with or without the baby robin and egg. So, one is more simplified, and this one I’ve used shows off the baby bird and that cute egg. I couldn’t resist playing with this one first. Marcy does birds so well! I printed the image quite large so it would cover almost the entire card face, and also lightened the lines up just a little bit so the image was more gray than black. Marcy offers no-line versions of both the images, but I didn’t want to go quite that light, so I just made the black lines slightly more transparent in Word, decreasing it by about 30%. Marcy thought this image would be a good opportunity to play with blues and purples so that’s what I did. I found a gorgeous columbine that is a bluey-purple and then one that’s a regular purple. I also LOVE LOVE LOVE Hosta, and the blue-green varieties are my favourite, so it was a joy to add that colour in there. It was so fun to colour that baby robin! I wasn’t sure if they start to have a red breast when they’re little, but I found one type of baby robin that starts with a soft orange breast and that went perfectly with with columbine centres. I added a little soft orange into the leaves of the columbine as well to tie it together bettter. The sentiment is from Power Poppy’s set, Potted Primroses. I gave the napkin underneath a striped pattern in the blues that match the bluey-purple columbine. And, I added the white polka-dots to the cup with a white gel pen. It’s such a beautiful image! Hi Christine! Your coloring work is gorgeous!!! I love how real the little bird looks and how beautifully all the colors work together. Oh to be so talented. Love the card and thanks for sharing. This is beautiful beyond words, Christine! I will wait patiently for the clear stamp release. Some time would you consider doing a coloring video? I just ordered more blue copics in anticipation of this Columbine! WOW Christine. Incredible. Impressed w how u tied together the soft orange w the baby robin, the leaves and the flower centers. The napkin was sooo interesting w the stripes! Ohhhh the flowers were just beautiful w the purples a d blues as well as the hosta leaves. You have such a gift for colors. I ALWAYS show my husband your work as he totally enjoys too! I just adore this Christine! You have done a stunning job with the stamp! Seriously swooning!! 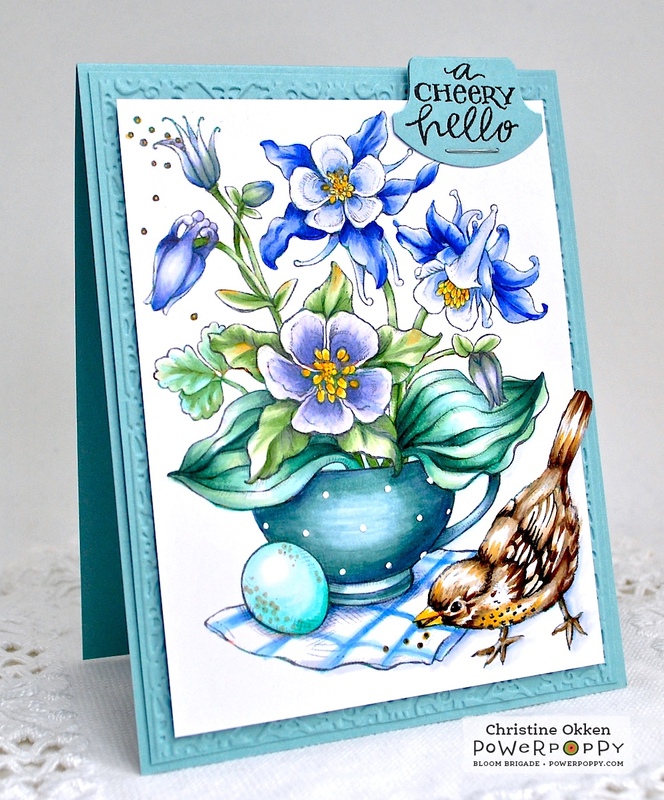 Oh Christine I do love this, your coloring is just beautiful, excellent even on the bird!! Gorgeous, Christine! You did a beautiful job on all of it, and I especially love the blue-greens and the bird. Outstanding!